Thanks for joining me on my adventure blog. I write weekly about my adventures. Some adventures are big and some are small. I hope to inspire others to get outside and enjoy this beautiful world. With a little weekday planning, anyone can explore the outdoors where they live and have a fun weekend adventure. This weeks adventure was at the Snowbird Cirque. The Cirque splits Snowbird in half. It's a beautiful mountain ridgeline with awesome skiing on both sides. You can access the Cirque from the Tram or with a quick traverse from the Little Cloud lift. Below is a picture of the north-east facing Cirque with the Snowbird Tram in the distance. You can see the many of the famous Snowbird ski chutes in the picture. There are many famous ski runs at the Cirque. Just as you approach Hidden Peak from the tram, you'll see Great Scott. This run is fun on most days of the year. Depending on the snow level the entrance can be a little sketchy. The rest of the Cirque is divided into the following sections: Upper Cirque, Middle Cirque, and Lower Cirque. You can access the Middle Cirque and the Lower Cirque from a run called the Cirque Traverse. The views from the Cirque as amazing. Just to the west, you see the Salt Lake Valley and looking to the north you'll see majestic Mount Superior. On certain days of the year, you'll see ski tracks down that amazing peak. The picture below was taken from the top of Middle Cirque with Mount Superior in the distance. The Lower Cirque is full of tons fun ski features. 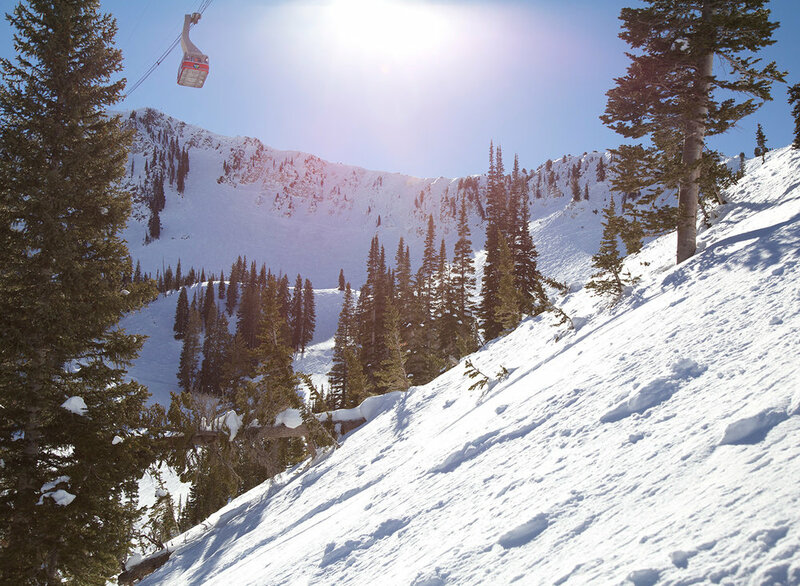 You'll find cliffs, jumps over trees, and other fun features that make the Lower Cirque a awesome ski playground. It is a fun place to ski on all types of snow conditions. The picture below is of the ridge just above the Lower Cirque. The Lower Cirque has some fun cliffs and tree jumps. These features change as the snow levels increase and decrease throughout the year. Below is a picture taken from one of my favorite cliffs at the top of Lower Cirque. Here is another shot. Tons of ski playground features on the Lower Cirque. The Lower Cirque has a lot of character. You can ski open bowls and nice tree shots. If you look around you'll find a few tree stumps you can jump off. The stumps and smaller trees become perfect launch pads. The Cirque at Snowbird was a blast. If you ever find yourself at Snowbird, make sure you head over to ski the Cirque to take in the views and the fun terrain. What did I capture the pictures with? Shot using the Canon 6D with the L Series EF 24-105 f/4L IS USM.